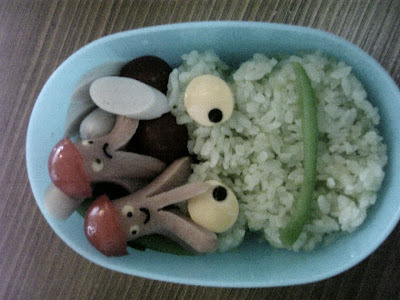 I had to make BabyEbi a bento today, I was inspired by all the rain to make a froggy one. Cute huh? Green rice (using pea flavouring) with sugar snap peas, taco weiners (mini sausages made into octopus) wearing tomato hats, fish sausage and there are some beans hidden underneath.